While learning to study the Bible is important, we must always remember that it isn't primarily a religious text book full of instructions and rules about life to learn. 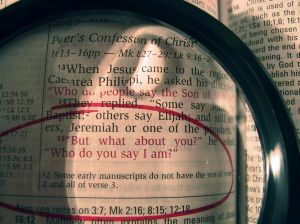 The Bible is the main way God is revealed to us. Spending regular, daily time, slowly reading, meditating on, and praying the Bible is a powerful way to deepen a relationship with God and to allow God's grace to continually flow into our lives. 1. It is God's Spirit who inspired the writing and passing on of the Bible. The same Spirit who inspired the Bible is available to speak to each of us through it. 2. Since ALL of the Bible is inspired by God, it is important to have a systematic way to continually cover reading all of it. A great resource for getting into the Bible is YouVersion. You can access the whole Bible in various versions from this site. There are also multiple "reading plans" that can help you to pace yourself through scripture. The best thing about YouVersion is that it has downloadable apps for all types of smart phones and tablets so you can take your Bible anywhere your phone goes. 3. Although it is important to cover the whole Bible, it is also important to SLOW DOWN and enter a conversation with God through reading, meditating on, and praying as you read scripture. There is an ancient method of doing this that is being revived today known as Lectio Divina.